This is our custom-built Specialty "Stereo Y" cable with Gold TRS 1/8" (3.5mm) Male to connectors of your selection. Construction is Mogami 2528 cable, with Switchcraft gold 1/8" connector, and a large selection of connectors. The Stereo TRS 1/8" Male "Y"s to your selection of connectors (one Left shrink labeled white, one Right shrink labeled red). Neutrik and Switchcraft connectors are some of the best connectors around. 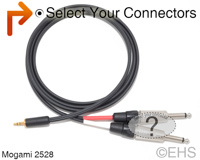 Mogami 2528 cable is a dual unbalanced cable in a zip-cord style and is very flexible, durable, light-weight cable. Photo 1 shows 6' cable with the primary 1/8" and TS as the selectable connectors.